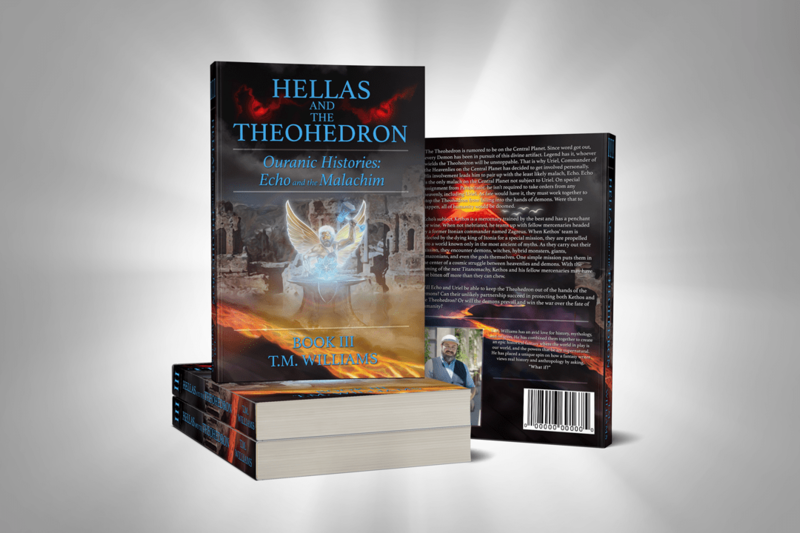 My third novel “Hellas and the Theohedron” is finally in post production and will be available soon. This third installment is the newest tale that Chronicles our main guardian angel, Echo, as he is sent to protect humans to whom he is assigned and to work with his fellow heavenlies to prevent demons from taking over the empires of humanity. Stay tuned to more updates coming about the books availability. I’m planning a Fall release party to celebrate book III and will be selling physical copies. In addition, you’ll soon be able to get a copy of Hellas and the Theohedron (eBook and Kindle formats) direct from my website and most major distributors. So what is Book III about specifically? Below, I will leave you with the back cover blurb to give you an idea of what Echo and his subject Kethos will be dealing with. Kethos is a skilled fighter, trained by the best. Due to his second-class citizen status, he joined a team of mercenaries. When his team is selected for a life-or-death mission from the dying king of Itonia, Kethos finds himself in the middle of an epic battle that will lead him into things only encountered in myths. Chasing Amazonians, fighting witches, and encountering gods and monsters are just a taste of what’s to come. Kethos’ mercenary group is getting more than they bargained for. For Millennia, Echo has had free reign in how he protected his subjects. Uriel is the commander of all the Malachim on earth. With rumors that the legendary Theohedron is on earth, every heavenly and demon is on a mission to retrieve it. The Theohedron promises unlimited power to its wielder. In the hands of a demon, humanity is doomed. Echo is forced to team up with Uriel to protect Kethos and his crew from powerful demons, hybrid monsters, and deadly magic. Uriel is used to commanding everyone around him. Echo is used to doing things his own way. As fate would have it, they must work together if either of them are to succeed. Will Kethos’ team be able to accomplish their mission and survive monsters, gods, and witches? Will Echo and Uriel successfully locate the Theohedron? Can humans and heavenlies cooperate enough to prevent a demonic takeover of earth? Feel free to contact me if you’re interested in preording a physical copy of Hellas and the Theohedron by filling out the form below.